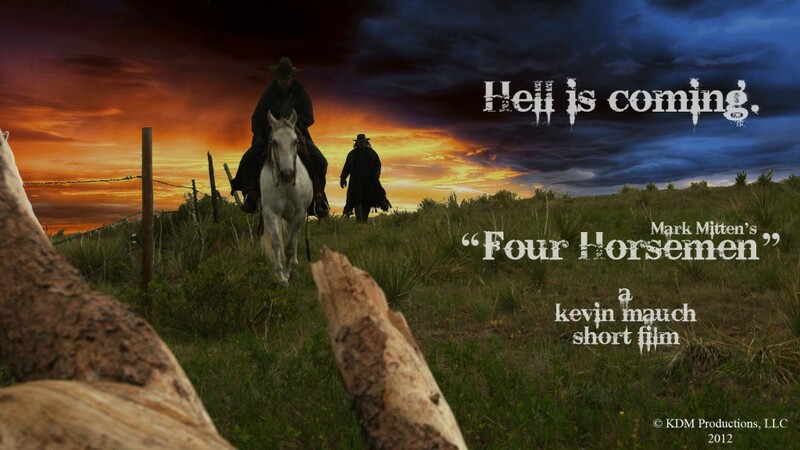 “Four Horsemen” Teaser Trailer from KDM Productins – Kevin Mauch on Vimeo. Video not loading properly? Go to: KDM Productions’ VIMEO page. Another song to come from “Pour Me” was “Four Horsemen”. “In late 2010, Mark approached me about directing a music video for “Horsemen” and of course I was interested. I told him I’d want to do something with the song that brought a third dimension to it….not just an ordinary music video that featured him playing the guitar and singing. There’s nothing wrong with that…it just isn’t something I wanted to do.”, says Kevin. “Mark agreed and let me take my time in coming up with a concept and script. A year and a half later we started production in June 2012 and it’s been a lot of fun to do this project and weave the fabric of a music video into a short, narrative film.”, says Kevin. A teaser trailer is located at the top of the page. The full-length project is currently in the VFX phase and we plan to release the video when Mark’s next album nears completion. KDM Productions, based just outside Denver, Colorado, was founded in 2001 by Kevin Mauch. Kevin has been working in the field of video production since 1994 and graduated from the University of Colorado with a B.A. in Recording Arts in 1998.